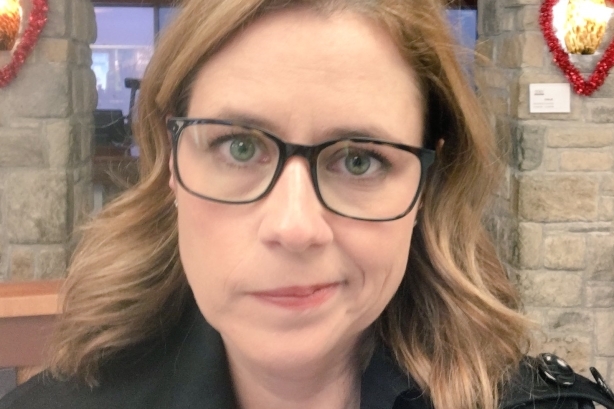 Stranger than fiction: The restaurant chain and Jenna Fischer, the actress who played Pam Beesly Halpert on the show, had a comedic back and forth on Twitter on Tuesday. DALLAS, TX: After an 11-year ban, Chili’s Grill & Bar is allowing Pam Beesly Halpert, a fictional character from The Office, back into its chain of restaurants. To recap for those not familiar with the back-story: Beesly Halpert was banned after drinking a bit too much at a Chili’s and then shouting, "I feel God in this Chili’s tonight," thus disturbing the other patrons, in an episode of The Office. Real-life Chili’s lifted the ban on Tuesday, following a Monday tweet from Jenna Fischer, the actress who played Beesly Halpert on the show, which included a selfie of herself in front of a Chili’s with the text: "Should I try to go in?" @jennafischer we hope you felt God tonight. But then published an official release about removing the longstanding ban. "After reviewing the good conduct of [Beesly Halpert], I have decided to lift the now 11-year ban," said Kelli Valade, president of Chili's, in the statement. "[Beesly Halpert] is an inspiration to many and we welcome her with open arms." One hour after posting, Chili's tweet with the link to the release had been retweeted 4,200 times, and likes 5,500 times. Fischer quickly responded on social. Chili’s correspondence on social with Fischer actually goes back to Sunday, when the actress tweeted out a picture of a mug she had received from Etsy that had her "I feel God in this Chili’s tonight" quote scrawled on it. The brand liked the tweet at the time, but did not respond. "At that point, we didn’t think it would be a great brand fit to reply," said Chili’s social media manager Luz Infante. But Fischer’s latest tweet, posing the question of whether or not she should try to enter a Chili’s, was something the brand knew it could have fun with. Chili’s internal team collaborated with the brand’s social AOR, The Marketing Arm, around the response, but the inception of the idea for the release came from Valade. "We got copywriting support because we wanted to play it more tongue in cheek the way [The Office] did," said Chris Ebbeler, director of social and community engagement for Chili’s. "They did a brilliant job of making it feel like you were in on the joke, which is why we took that approach rather than taking ourselves too seriously." Ebbeler explained that Chili’s comms team is working hard on eliminating bureaucracy from its social channels. Ebbeler stepped into his current role in January; he was previously director, workplace community, for Chili’s. "In my previous role, I was telling our culture story, about how we don’t take ourselves too seriously," he said. "Me starting in my new role is a nod to that: we need to lighten up, engage more, have more fun, and build a stronger sense of community."